Noon Year's Eve with a DJ! Looking to celebrate the new year at a more reasonable time? Join us for our New Year's Eve Party. 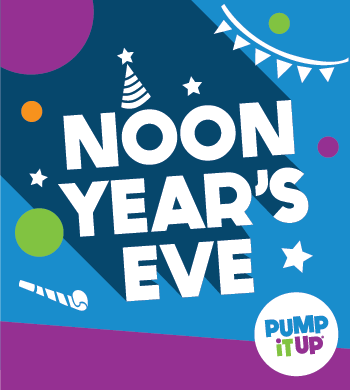 Enjoy bouncing, dancing with a DJ, balloon drop, GLOW experience, pizza for children and more! Only $13 per child. Sorry, jump passes, cannot be redeemed for this event. This event has sold out the past several years so reserve your spot online today! Join us for an evening of FUN and playtime in our safe and secure environment. Let the kid's enjoy a bouncing, laughing, sliding, ecstatic extravaganza while you take some time off for yourself! 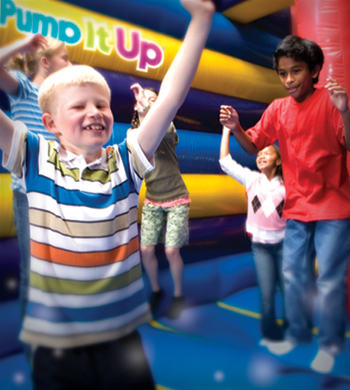 At Pump It Up, they'll have tons of fun in our huge arenas, filled with our gigantically fun inflatables. We'll even feed them for you! Space is limited and spots fill up FAST! Call now to reserve! *Children must be potty trained to attend. **Please notify our staff if 1:1 attention for your child may be required, additional fees may apply.